For the ship attacked by Somali pirates, see SY Quest incident. Quest was 111 feet (34 m) in length, had a beam of 24 feet (7.3 m), and 12 feet (3.7 m) depth of hold. The vessel has been variously rated at 209 and 214 gross register tons, possibly due to the 1924 refit described below. Quest was originally built in Risør, Norway in 1917 as the wooden-hulled sealer Foca I or Foca II. She was the polar expedition vessel of the Shackleton-Rowett Expedition of 1921-1922. The vessel was renamed Quest by Lady Emily Shackleton, wife of expedition leader Ernest Shackleton. At the expense of expedition financier John Quiller Rowett, Quest was refitted for the expedition with modifications overseen by sailing master Frank Worsley, including re-rigging and the addition of a deckhouse. Shackleton was a member of the Royal Yacht Squadron, and so for this voyage Quest bore the RYS suffix and flew the White Ensign. 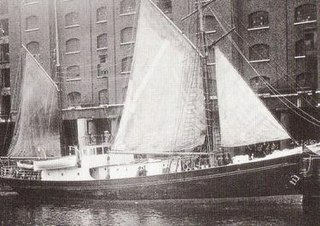 Sailing from London for the Southern Ocean on 17 September 1921, the ship reached South Georgia on 4 January 1922 while preparing to enter Antarctic waters. The following night Shackleton, the commander of the expedition, died aboard the vessel while she was at anchor in Grytviken. This ended all prospects of the expedition's carrying out its original program of exploring the Antarctic coastline of Enderby Land. Led by Frank Wild, Quest carried out a desultory survey of the Weddell Sea area before returning to the South Atlantic. Quest touched the Tristan da Cunha archipelago in early May, and at Inaccessible Island, ornithologist Hubert Wilkins took type specimens of the grosbeak bunting. The expedition returned to England in July 1922, having posted disappointing results that were attributed both to replacement commander Wild's alcoholism and deficiencies in Quest's performance in polar sea ice. 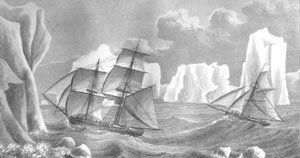 The weakly powered ship's engine caused continuous difficulties, and the vessel's straight stem made her unsuitable for use in icy seas. Quest was again refitted in Norway in 1924. During the refit, the sealer's Shackleton-Rowett deckhouse was salvaged for shore use. In 1928 the refitted vessel participated in the effort to rescue the survivors of the Italia Arctic airship crash. In 1930, the aging sealer, described as a "broad-beamed, tubby little ship, decks stacked with gear", served as the primary expedition vessel and transport for the explorers of the British Arctic Air Route Expedition from London to eastern Greenland in 1930. Quest returned to service as a sealing vessel after 1930. In 1935 she was used by the British East Greenland Expedition. During World War II the wooden-hulled vessel was pressed into service as a minesweeper and light cargo vessel. The small ship returned to sealing duties in 1946. On 5 May 1962, while on a seal-hunting expedition, Quest was holed by ice and sank off the north coast of Labrador. The crew was saved. Parts of the former deckhouse, including Shackleton's quarters in 1921-1922, survive and, as of February 2010, are under restoration in Sandefjord. The South Georgia Heritage Trust (SGHT) Norway has announced plans to return Shackleton's final home to South Georgia; the cabin will be housed at the South Georgia Museum in Grytviken. The projected date of transport and re-erection was 2011-2012. An archival collection of 476 photographs from the Quest/Shackleton-Rowett Expedition is maintained by the State Library of New South Wales in Sydney, Australia. ^ a b c d "M/S Quest". warsailors.com. Retrieved 2010-10-01. ^ "Antarctic Ships". antarctic-circle.org. Retrieved 2010-03-03. ^ a b c "Shackleton 'Quest' cabin, new show piece for South Georgia Museum". MercoPress. Retrieved 2010-03-03. ^ a b c d Huntford, Roland (1986). Shackleton. New York City: Atheneum. pp. 683–694. ISBN 978-0-689-11429-8. ^ a b c Thomson, John (1999). Shackleton's Captain: A Biography of Frank Worsley. Oakville, Ontario: Mosaic Press. pp. 133–141. ISBN 0-88962-678-2. ^ Scott, Jeremy (2008). Dancing on Ice: A Stirring Tale of Adventure, Risk and Reckless Folly. London: Old Street Publishing Ltd. ISBN 0-689-11429-X. ^ "The Shackleton-Rowett Antarctic expedition aboard the 'Quest', 1921-1922". Hubert Wilkins and Alexander Macklin. Retrieved 2010-03-11. Rowett Island is a rocky island 0.5 miles (0.8 km) long, lying immediately off Cape Lookout, Elephant Island, in the South Shetland Islands. Rowett Island is located at 61°17′S 55°13′W. Rowett Island was known to both American and British sealers as early as 1822. Rowett Island was named by members of a British expedition (1921-1922) under Ernest Shackleton for John Quiller Rowett, chief patron of the expedition. The British Arctic Air Route Expedition (BAARE) was a privately funded expedition to the east coast and interior of the island of Greenland. The expedition, led by Gino Watkins, aimed to draw improved maps and charts of poorly surveyed sections of Greenland's coastline, and to gather climate data from the coast and interior icecap during the north polar winter. The expedition explored East Greenland in 1930-1931.